There are very few people who live the life of their dreams, but there are even fewer who get the death of their dreams! There are very few scientists who are remembered for their work, but there are even fewer politicians who are respected in a devotional manner. Such was the personality of Dr APJ Abdul Kalam – an ordinary child who rose to extraordinary podiums and achieved what many of us can’t even dream of! No, he didn’t earn filthy amount of wealth, neither did he build big palaces for himself nor did he buy a fleet of luxurious cars, but what he earned is something that is toughest to get, and that is – genuine, unadulterated, pure respect! He wasn’t respected because of his political stature or his scientific contributions alone, but also for his grounded personality, his non-materialistic lifestyle and his devotion towards his work. He didn’t marry. Neither did he have any child to take his legacy forward. But he left an entire country of 120 million people in tears today! Calling him just an inspiration would be an ‘understatement’, for he deserves far more than that, so we Indians, tagged him as – #MissileMan. A man, who brought in his revolutionary ideas and his ultimate scientific knowledge to use, and re-engineered India’s defense system into one of the world’s most powerful ones! 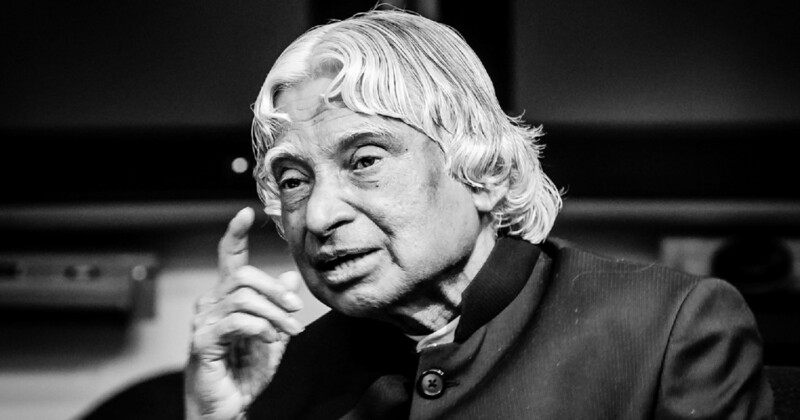 APJ Abdul Kalam is not just a name, but an era. He was the 11th President of independent India, and I guess, the only Indian politician so far, who has zero haters! Nobody, not even a single person has ever written, spoke, even tweeted about him negatively – that is the kind of person he was! He was fond of children and always inspired every child, from the poorest of the poor regions to the ones studying in posh-schools – to do something innovative! He himself was born into a humble and poor South Indian family, but worked hard and studied even harder to become an Aerospace Engineer, and later – a scientist. He contributed greatly towards making of modern India by designing satellites and missiles for Indian defense. He has earned a series of accolades and awards under his name, not only from India, but from other nations as well. And he got it. He took his last breath while doing what he loved the most – Teaching among his Students. Not everyone is as lucky to get a pain-free, torture-free death, and that too by being among the people he loved. He served the nation till his last breath. That is the kind of life, he lived. And that is the kind of legacy he has left behind. Well written Mehak.its so true that there wont be even a single person with negative view about Mr.Kalam. I guess if every person on this earth adopt even one little thing that Mr.kalam taught us then we all can succeed. God bless you Mr.Kalam wherever you are. Every word that you have written above is what every Indian would want to write, would want to express.. His knowledge, his wisdom, millions of hearts he has won, a spotless career and character.. the kind of benchmark he has raised for everyone of us is more than a dream, yet worth giving every shot to it. I’m sad and so is the entire nation. Without ever meeting him in person, still there is grief in me taking a birth inside. Such was his power.. Very well written Mehak. Each and every single word is so true about Dr. Kalam, he will always be an inspiration for everybody. He was a true man who changed the minds of millions of people. He showed the world that by persistence, determination and hardwork one can achieve their dreams. Thank you Rishi…and yes, he will always be with us, in the form of his inventions, his ideas and his theories! Thanks for writing the article. Apart from being a great scientist, he was one of the best presidents that our country has seen. During his tenure he used his presidential powers to reject controversial bills multiple times which is rarely seen in politics. Although I’m a Pakistani. His line ” I want to die as a teacher touch my heart. It’s a dearest and deep wish on could had. Teacher is mentor, courage and inspiration for every one. Teaching has no constraints. RIP Abdul Kalam. Thank you so much Muddassir! 🙂 He was not only a proud Indian, but a really talented human being. His loss isn’t a loss to India alone, but to entire humanity!